I am a 2018 blog ambassador for Lakeshore Learning. I am compensated for my work and received products free of charge. All products were hand-selected by me with a special education classroom in mind, and opinions are 100% mine. If you’re a teacher on social media, you’ve probably spotted tons of Lakeshore Learning products in your newsfeed. But why are educators so obsessed with these products? Is it the pretty colors? 1.) Lakeshore Learning products are the highest quality. They are durable and made to last year, after year, after year. 2.) These products are functional because they were designed by teachers, for teachers. This Turn-In-Your-Work Organizer is perfect for homework or important paperwork! 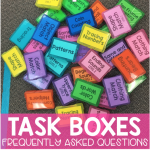 Or searching for engaging materials for your small group lessons and centers—Lakeshore has you covered! Increase literacy skills with these Stack & Build Phonics Flip Books! While Lakeshore has been known for their high-quality learning materials for decades, they are now making even bigger waves in the education world with their line of flexible seating furniture, Flex-Space. Ever since I was a kid, I hated sitting at a desk. The second I would get home from school, I would dump the contents of my backpack onto the floor, sprawl out across the room with my textbooks, and get started on homework. This habit followed me into my college days, and even into adulthood (as I write this post from my bed with my lap desk). Sure, standard desks and chair serve their purpose in the classroom, but it’s no surprise the term “flexible seating” is such a buzz word these days! Providing alternative seating promotes both independent and cooperative learning opportunities, allowing students to explore how they learn best. Lakeshore has everything you need to successfully implement flexible seating in your classroom. Their Flex-Space Comfy Floor Seats, Flex-Space Wobble Cushions, and Wobble Chairsare just a few of my favorites in the collection! Lakeshore is giving away a dream classroom to one lucky teacher in need, through Lakeshore’s very own Flex-Space Giveaway Contest. This HUGE giveaway contest is running now through October 12, 2018 (3p.m.PST)! See details of entry below. Contest is being held here on the Lakeshore Learning website. Be sure to check out Lakeshore Learning online and use this coupon for 25% off any non-sale item on your next purchase!